As one of the best acai bowl shops in town, Amazebowls has grown from a truck to a brick and mortar in Downtown L.A. (as well as a window on the Venice Boardwalk), selling their popular bowls and smoothies from the Arts District. Try the classic Amazebowl made with acai, blueberries, pineapple, banana, agave and hemp milk; or the Instagram-friendly Coconut Acai Bowl served in a chilled coconut and topped with a slew of superfoods. They should be renamed AMAZE-BALLS! I've seen their Instagram-friendly açai bowls and I'm pleased that they're just as good as they are beautiful. 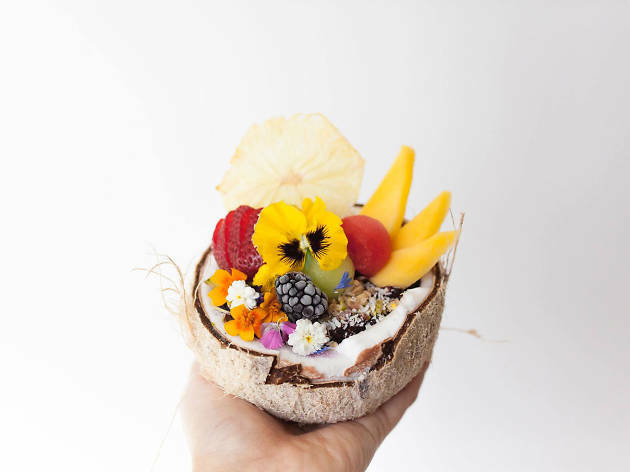 The coconut bowl is full of so many delicious and healthy ingredients. I love the pretty edible flowers and pineapple crisps. Full disclosure, I haven't tried amazebowls at their brick and mortar location. I DID however get to try them at Smorgasburg LA (which as a side note, if you haven't tried that..look it up!) I decided to spend the few extra dollars to get the fancy bowl with the edible flowers and bee pollen, all in a coconut bowl! I will say that it is just as delicious as it looks. Super refreshing and you really can taste every element that goes into assembling it! That being said, I wasn't really thrilled with he fact that the coconut was frozen, I think I had imagined that I would be able to eat the bowl once I was finished which...well the coconut just never really defrosted so that was a bummer. But maybe that's on me. Delicious all the same though! I just wish that there was more of it!